I saw this adorable idea on Pinterest for a Fairy Door. 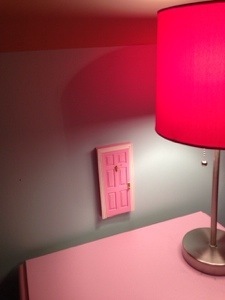 The purpose of the fairy door is just to add a bit more fun to the Tooth Fairy. We put the door up shortly after Kati Ann lost her first tooth. Since then, “the tooth fairy” often leaves the door cracked when he/she comes to visit and leaves a glittery mess of fairy dust behind on his/her way back out the door. All I did was buy a dollhouse door at Hobby Lobby along with a knocker and knob. Kati Ann & I painted it pink together. Before we mounted it to the wall, we decided to add a pretty scene from a magazine to the opening so it we could imagine what “fairy land” looked like. Question: What fun things have you done with you kids for the Tooth Fairy? I had never heard about this idea. It is precious. Hopefully, I can remember to do it for my grandkids.